Standard movement: Stand in virabhadrasana 1, right side. Take a deep breath, and on the exhale bend the torso forward, and rest the chest on the right thigh. Keep the arms straight, pulling forward. Take a couple of breaths, and get your balance. Exhale, and simultaneously lift the left leg from the floor swinging the body weight straight forward. Straighten the right leg. Level off the hips turning the hip and leg downward but keep the left leg level with the body. Hold the pose for 3-5 breaths. The whole body should be parallel to the floor. Reach out through your toes, crown of the head and fingers making one straight line. After 5 breaths, step back to virabhadrasana 1. Variations: From mountain pose (tadasana), extend the left leg behind and extend the arms straight up. On the exhale lean the upper body forward, keeping your hands extended. Once in the pose, you may also bring your arms to the side of the body, parallel to the body or hands on the hips. In many ways, my philosophy as a yoga teacher is different from others. I see yoga and yoga asanas as just one variable in the total equation of spiritual freedom, as well as physical and emotional vitality. As a man, I feel yoga is the yin to the masculine yang. The practice of the yoga discipline acts as a catalyst and allows one to become more in touch and pursue other life-important qualities like patience, focus, non-judgment, discipline and tenacity. 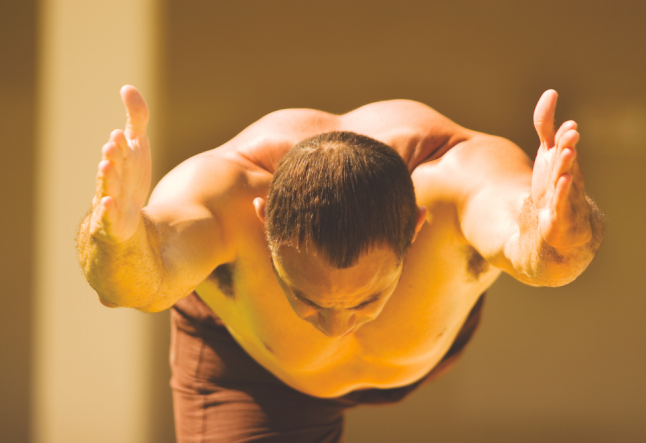 As a yoga practitioner for twenty-two years, my yoga practice and understanding has evolved. It is this evolution and experience that enables me to communicate to my students. A former collegiate track sprinter, I started doing yoga after my sophomore year. Although I continued to practice hatha while training martial arts, it was five years later that Ashtanga and Power Yoga became part of my daily practice. I find yoga, in conjunction with weights, running and body exercises to be perfect compliments. Virabhadrasana 3 (Warrior 3) is a pose that combines strength, balance and focus but also conveys harmony, poise and power. Once in the pose, the body extends flat, perpendicular to the standing leg and parallel to the floor. The balance of the pose stems from the strength of the standing leg. While holding the pose, the standing leg becomes toned, and the leg and ankle become sturdier. The action of the body extending forward and opposite leg pulling backward not only tones the abdominal muscles, but this pose helps with the symmetrical growth and alignment of the back muscles, and promotes spinal elasticity. Most people tend to stand on their heels, affecting the spine, hips and organs. A firm virabhadrasana develops the sole of the foot, discouraging awkward heel balance. This pose is ideal for runners. Overall, virabhadrasana strengthens the hips, back and invigorates the whole body.